What have we here? 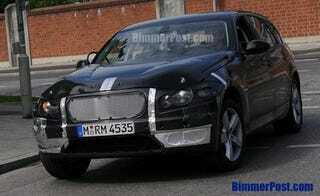 It looks to be some sort of tarted-up BMW wagon, and according to the guys at BimmerPost, it's a mule for an upcoming 3-Series based crossover to be known as the BMW F3. Of course, there's no way to be sure. The last time we saw a lifted E91 we thought it was an X3 powertrain mule. Then there's some people who think this little black wagon is a mule for the X1. So what is it really? Who cares? If you want a lifted 3-Series wagon, why not buy a 3-Series wagon and have it lifted? Really, how many niches must there be? Does the world actually need something that's part wagon, part SUV, part minivan, part sedan? The bad part is that once the F3/V3/X1 finally does arrive, it won't actually be a bad vehicle. We'll test drive it, and declare that it's well-built, drives well, and is quite practical. And then people will buy it. Profit will be made. Other automakers will take notice and build similar vehicles. The niche will be filled. Then, two new niches, one to either side of the old niche, will be created. Those niches will be filled, and sooner or later we'll all be driving (or merely riding along) in nondescript blobs. Our children will have no knowledge of hoonage, at which point the world will likely end.